If you can sew on a button, you can do bead embroidery! Our new version 2.0 Edward Scissorfish pattern introduces new stitches and techniques not used in the original version! You’ll also complete Edward in less time using the new stitch patterns. 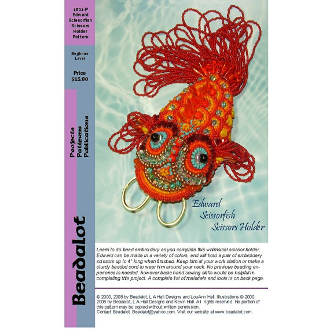 Pattern contains full-color detailed instructions and a foundation paper printout to use to create one Edward Scissorfish. When completed, Edward will hold a pair of embroidery scissors up to 4" long.